Forfar Athletic collected their third victory over Annan Athletic to retain their position at the top of the league. The table toppers however may consider that they were fortunate that Annan were in a generous mood conceding two goals which once again emphasised the defensive problems which have plagued Annan for the past 2 seasons. There was not a lot between the teams but enough for all to see why Annan will struggle to make the play offs. 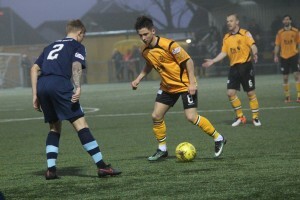 Forfar defensively were solid limiting Annan to very few opportunities where as Annan conceded two disappointing goals. Annan are conceding goals at a regular rate for them to be considered as serious promotion candidates and unless they find a solution to eliminating the errors at the back they will struggle to make a real impact at this level. The Annan starting line up showed several changes from the team which secured the points at Broadwood with Swinglehurst, Cuddihy and Ramsay all injured along with stand in keeper Alex Mitchell, manager Jim Chapman elected to throw his most recent signing Smart Osadolor straight into the action so it was a much changed line up which was expected to secure the victory against the title favourites. Annan took the lead from the penalty spot in the 24th minute, it was a cheap goal for the visitors to lose when Jamie Bain’s challenge on Max Wright presented Annan with a penalty and Max Wright despatched the spot kick into the corner of the net to give Annan the opening goal. Raffi Krissian was presented with a clear scoring opportunity in the 32nd minute when he blasted the ball over the bar from 12 yards following a corner kick. Forfar squared the game in the 38th minute , Lewis Milne created the opening from the right touch line when he had the space and the time to cross a high ball into the centre of the Annan defence and Jamie Lister timed the cross to perfection when he rose between Watson and Krissian to guide the ball beyond Currie in the Annan goal. Annan were left chasing the match at the start of the second half when they conceded a comical goal, after a long throw in resulted in defensive mayhem in the Annan defence which ended with Lewis Milne cutting the ball back from the bye line and the ball srtuck the heel of Rabin Omar before it came off the foot of Callum Home and rolled over the goal line. It proved to be the defining moment of the match and although both teams went all out to add to scoreline opportunities were few and far between. Osadolor went close with a snap shot on the 71st minute and David Cox shot over the bar in the 78th minute but there was no more scoring. It was a harsh lesson for Annan and once again their defensive capabilities were put into question. The stats prove that like last season Annan are conceding more goals than the teams battling out for the title around them. The margins between success and failure in this league are minute with only six points separating Annan who despite the defeat moved up into the fourth play off place for the first time this season, and the bottom team of the league Cowdenbeath. Annan’s next 2 fixtures are both away from home to title contenders Elgin City and Arbroath where it will be difficult to collect points but for Annan to retain their current position in the league they will need to be a lot less generous at the back. ANNAN ATHLETIC : Blair Currie, Callum Home, Jean Guy Lucas (Adam Asghar 85 min), Raffi Krissian, Peter Watson, Gavin Skelton, Rabin Omar, Nathan Flannigan, David McKenna ( Aiden Smith 68 min), Max Wright (Przemyslaw Dachnowicz 70 min), Smart Osadolor .Substitute’s not used Stephen Bronsky, Tony Ribeiro, Ellis Pearson. FORFAR ATHLETIC : Adam Grant, Michael Travis, Jamie Bain, Andy Munro, Thomas O’Brein, Martin Fotheringham ( Eoghan McGawn 40 min), Jamie Lister, Lewis Milne (John Peters 80 min), David Cox, Gavin Swankie, Danny Deholm,.Substitutes not used – Joe McGovern GK, Michael Kennedy, Marc Scott, Allan Smith, Kerr Hay. REFEREE: Craig Charleston, Assistants John McCrossan and Finlay Currie.